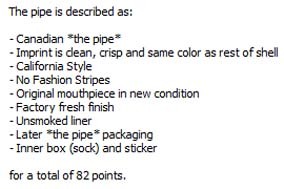 The value of pipe #805 is 82 points. Earl T Burton (gxdx48a) offered a lot on eBay that included a lighter I wanted so I went for it. This pipe was part of the lot. My previous example is equally good. So this one, perfect as it is, goes to the Pipe for Sale page. James Owen found it here and wanted it and added it to his collection.